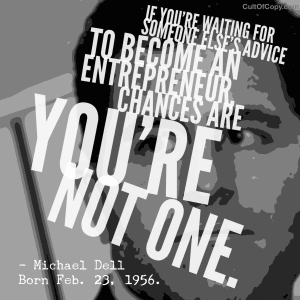 “People ask me all the time, ‘How can I become a successful entrepreneur?' And I have to be honest: It's one of my least favorite questions, because if you're waiting for someone else's advice to become an entrepreneur, chances are you're not one.” – Michael Dell, Born Feb. 23, 1956. Now, many of my friends know I don't consider myself an entrepreneur. I think of myself more as self-employed. But this sentiment applies there, too. And basically anywhere and for anyone you might want to become. Unless you're talking about something you need special schooling or a special license for, you don't need anyone's permission but your own. Don't even ask anyone about doing it. Just do it. If you want to do it, you'll figure it out as you go. You don't need anyone's opinions before you start. You need INFORMED opinions once you're facing the problems that crop up as a side effect of actually taking action and getting things going. But don't wait for your friends and family to support you. Don't wait for your superiors to grant you the clearance. Don't wait for peers to talk you out of making waves. Do your thing. Make that splash. Show it off with pride to people who have the same goals and you will rise. Having followers will make you a leader. Being a leader is a way to get paid to pursue and produce what you love. If that doesn't get you moving – the possibility of it – then go join the cult of picking boogers until you become worm food.